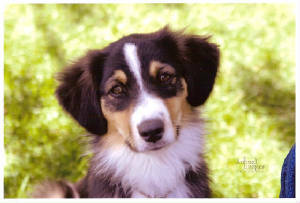 My pretty little girl--watch-out if she grows into those ears!! of puppies in Jul 12. 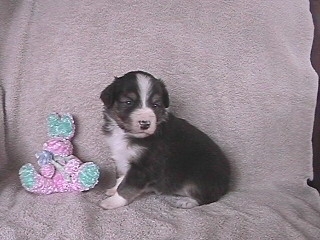 As Cha Cha is dual registered this litter is eligible for AKC Foundation Stock Service and AKC registry. and gave her a big kiss on the head-- then it was a done deal: ChaChaCha it stayed. 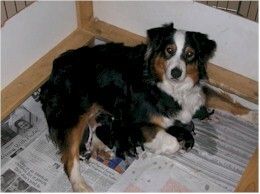 ChaCha was bred by Lori McClelland of Gottabe Aussies. We knew from the start that there was something special in this little girl and gave her the chance to prove it; and following in the foot steps of her parents, ChaCha started her show career off with a bang! 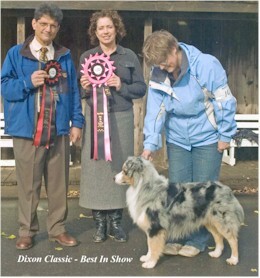 At the Sacramento Rarities & NAKC show she took all 4 herding group puppies and 2 of the 4 Best in Show Puppy! 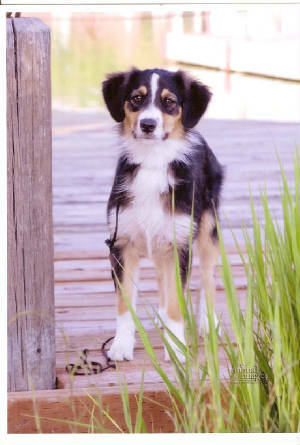 At the UKC Salt Lake City Show in May 07, she took all the Non Regular Aussie puppy classes and again in the Aug 07--Rancho Cordova CA -- Cha Cha takes her first Best of Breed & Group placement over finished dogs on 19 Aug giving her her first points toward her UKC and MASCA Championships!!! Thank you Lori for entrusing us with this beautiful girl!